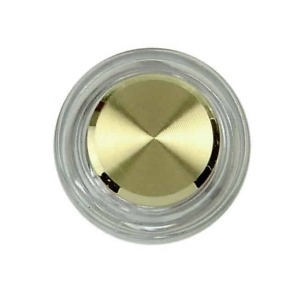 When you need to replace the worn out wired doorbell button, this gold rim finished white doorbell button is available in lighted and non lighted versions. Manufactured by Thomas and Betts, this is a replacement doorbell button, available in the lighted (DH1202L/DH1201L) and non-lighted versions (DH1202/DH1201). With a gold rim and white button for the DH1202 and a silver rim and white button for the DH1201, these are buttons ONLY, with the industry standard 5/8” diameter. Great to replace worn out and damaged buttons, the brass rim makes this product a great fit for many existing wired doorbell plates. If you are using a battery operated wired doorbell we recommend the DH1202 or the DH1201, the non-lighted version of this button. The lighted version will require a wired doorbell transformer. Prompt delivery of order. Product works as hoped. Easy-Peasy install. And they were the ones without the light and are really hard to find. 1800doorbell had them and sent them out very quickly. Thanks! These folks sent the wrong item at first. However, the customer service immediately answered my email and corrected the mistake and sent the item Priority Mail and the part came before the weekend. The part fit perfect, an exact replacement. Very good . Just what was needed fast delivery well packaged and easy to install. Thank you.